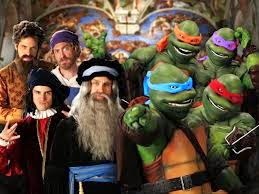 I dig me some TMNT but, I got to give this rap battle to the Renaissance Artist. This was pretty funny. At least this was good. Even people who LIKE that Rap/hip hop crap don't care for the new movie song 'Shell Shock'. Never thought I'd say this, but I wish they'd bring back Vanilla Ice.... Ninja Rap was goofy, but at least it was understandable and catchy! For the life of me, I will never understand why untalented executives think turtles and hip hop go together. happened in every movie but 3 and 4. which is why 3 and 4 have some of my favorite music! A shame a soundtrack was never released for 4! This video has caused a debate between my friend and I. The lyric mentions three toes, but my friend feels the turtles only have two. I've pulled out my "How to Draw the TMNT" comic, and the page on feet mentions two toes as well as a third toe. I'm pretty sure this is the first time I have ever been asked this question.